Robot Mode: After looking somewhat different in his Transformers Prime incarnation, Starscream largely returns to his G1-roots for Robots in Disguise. The look is pretty much classic G1 Starscream with maybe a touch of Animated thrown in, too (stylized look, long chin, the works). So basically in terms of looks this Starscream here is kind of a best-of look, combining aspects from numerous Starscream incarnations into one for a pretty good figure. Looks aside Starscream is a pretty average RID Warrior-class figure. Well-articulated, not overly complicated-looking, no real flaws. 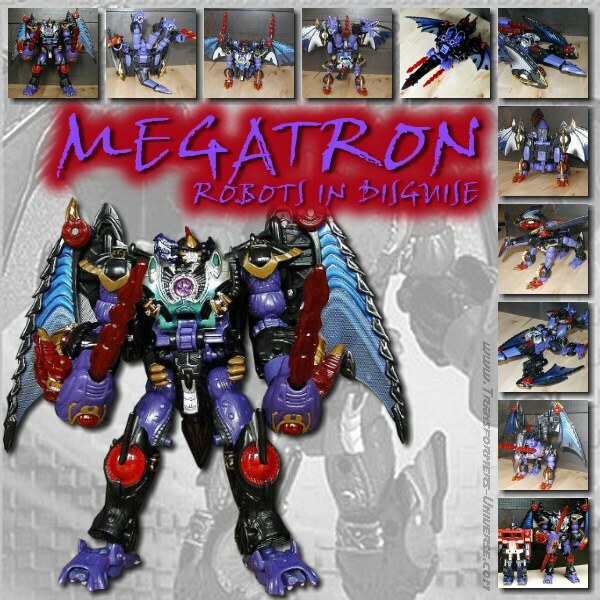 He comes with two arm cannons which he can remove and hold in hand, too, and the wings on his back can be put into numerous positions to pimp his look to your very own personal preferences. So overall, a nice-looking version of Starscream in robot mode. Not in any way revolutionary, but solid. Alternate Mode: Starscream transforms into a jet, naturally. The jet mode, too, seems influenced by Animated Starscream with its forward-swept wings, though the coloring is once again pure G1 Starscream. The jet looks pretty cool and everything snaps into place for a nice, tight fit. The guns can be fastened to the wing tips. Sadly there is no landing gear, which is somewhat disappointing, but really this mode’s only flaw. Otherwise, a pretty cool looking jet mode for Starscream. Remarks: At the end of Transformers Prime Starscream was looking to take over leadership of the Decepticons (what few remained) in the wake of Megatron’s departure, but it seemed to be a very short reign as he was visited by Predaking and his fellow Predacons. He apparently survived the encounter, though, as he is now appearing in Robots in Disguise. I haven’t watched as far as his appearance, I must admit, so I can’t really say much about it. But you can’t really have a Transformers series without Starscream, can you? Overall RID Starscream is a good, solid Transformers toy. There is nothing really new or spectacular about him, but neither does he have anything to complain about except the lack of a landing gear in jet mode. So while Starscream fans won’t find anything new here, neither will they be disappointed.